Anna Webber is originally from British Columbia, Canada. 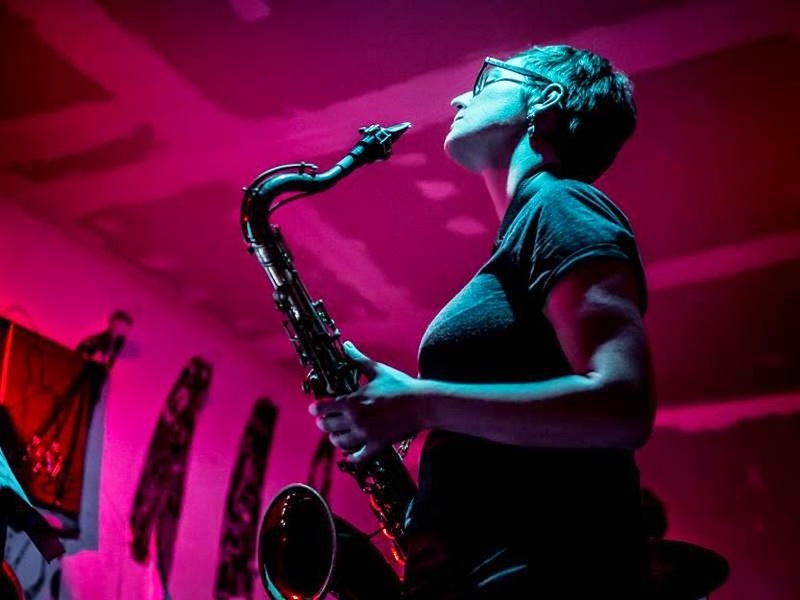 New York-based composer, saxophonist, and flutist Anna Webber, called "one of the most exciting new arrivals on the New York avant-garde jazz scene" by Peter Margasak (Chicago Reader), presents a compelling new septet which released its premiere album, entitled "Clockwise", on Pi Recordings in early 2019. The ensemble features many of the most interesting improvisors currently working in Brooklyn's creative avant-garde jazz scene. The music of "Clockwise" is conceived of as a loose homage to various works for percussion from the 20th century. Webber analyzed and examined the percussion music of composers such as Varèse, Xenakis, Babbitt, Cage, and Feldman, and through that found the seeds which would bring the music for this septet to life. Referred to as "action-packed" and "exhilarating" (Kevin Sun, Do the Gig), this ensemble integrates complexly notated music with improvisation in a way which feels natural despite its underlying rigor, creating music that connects with listeners on both an intellectual and visceral level. Anna Webber is a flutist, saxophonist, and composer whose interests and work live the overlap between avant-garde jazz and new classical music. Outside of the Simple Trio, Webber's other projects include her septet Percussive Mechanics, Jagged Spheres with Devin Gray and Elias Stemeseder, and The Hero of Warchester with Nathaniel Morgan and Liz Kosack. Webber is a 2018 Guggenheim Fellow. She has additionally been awarded grants from the Shifting Foundation (2015) and residencies from the MacDowell Colony (2017), the Millay Colony for the Arts (2015), and the Brush Creek Foundation for the Arts (2014). In 2014 she won the BMI Foundation Charlie Parker Composition Prize as a member of the BMI Jazz Composers' Workshop. Her new release, Clockwise, is an homage to some of her favorite 20th Century composers as seen through the lens of their works for percussion. For the project, Webber spent months researching and analyzing various percussion compositions by Iannis Xenakis, Morton Feldman, Edgard Varése, Karlheinz Stockhausen, Milton Babbitt, and John Cage, isolating particular moments that could be extracted and developed into new works. According to Webber, "The goal was not to re-contextualize the composers' original intents or ideas, rather it was to find hidden sympathetic points of resonance within the primary compositions that I could abstractly develop into new works". The music explores notions of density and indeterminacy, using timbre as an organizing principal, continuing Webber's ongoing exploration of the interstice between creative improvisation and tightly-prescribed compositions. By foregrounding timbre — including the use of extended techniques to create novel sounds — Webber explored questions she had unearthed while researching percussion music: How can timbre be the main driving force of a piece of music? What is left when one subtracts pitch and harmony, or rather, how can a piece be built without those things and what makes such a piece coherent? "Kore I" and "Kore II" inspired by the Xenakis masterpiece Persephassa, feels like the mechanical movements of an off-kiltered watch, with each gear rotation triggering another unexpected series of sounds. "King of Denmark I, II and III" take their title from Morton Feldman's graphic composition of the same name, and all stem from short, directed improvisations, with II and III assembled by Webber using recordings of improvisations from Ches Smith and Chris Tordini. "Loper" is a distillation of certain formal elements of Edgard Varèse's Ionisation, mixed in with explorations of highly-theoretical trombone split tones and saxophone multiphonics. "Clockwise" informed by Stockhausen's Zyklus, moves episodically through sections of varied density. Like its inspiration, the piece could hypothetically be performed in circular form, using any point in the piece as its starting and/or ending point. Milton Babbitt's solo snare drum piece Homilyserved as the organizational stimulus behind "Array," while "Hologram Best" takes its cue from Third Construction in Metal by John Cage. "Idiom II" is the one conceptual outlier on this album in that it is the one composition which Webber used codified and notated elements of her own improvisational language, rather than a specific percussion work, as the driving force. Despite the highly composed nature of the music, Webber leaves each musician plenty of room for solos as well as secondary opportunities for improvisation. With its idiosyncratic and specific focus on timbre, Clockwise is a highly disciplined work that still breathes with powerhouse improvisation, losing none of its emotion intensity and groove in its unpredictable twists and turns. Matt Mitchell sums it up best: "With her music, Anna manages to exhibit many distinctive recurring traits with an unmistakable consistency of purpose while still allowing for a wide variety of characteristics and moods. Obsessive repetition, inexorable unfolding, comprehensive timbral considerations, rhythmic vitality, a sense of the uncanny and the previously unheard. They present the chance for musicians to stretch themselves and to feel free within new environments. Sonic treasures abound."